I know nothing about Nigel Slater, have never read any of his books or knowingly seen him on television and I have never cooked any of his recipes. I don't quite know how he passed me by, as to say he is well known is an understatement. 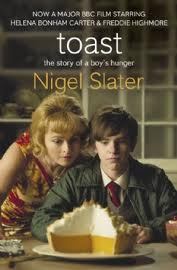 So when I saw that the film chosen for this month's Food 'n' Flix was the adaptation of his memoir Toast, I thought this was a good opportunity to get to know Nigel Slater. In the film, Nigel is a young boy; the story tells the tale of his relationship with his parents and step-mother and also his relationship with food. As the film begins, Nigel is in a shop with his mother; he asks if they can buy a pork pie and she refuses, saying it is common - then asks for a packet of Dairylea slices instead. Nigel introduces himself to the viewer: "I'm Nigel, I'm nine years old and I've never had a vegetable that didn't come in a tin'. Indeed, we see his mum boiling vegetables still in their tins - I didn't even know you could do that - and we learn that she is really a hopeless cook. The title of the memoir comes from the fact that when Nigel's mother burned the dinner, they had toast instead. Nigel loves food from an early age - when his father catches him reading under the blankets with a torch, it is a cookery book he is reading rather than anything more racy. Nigel is particularly taken with a recipe for spaghetti Bolognese, which he proceeds to cook for his parents; his mother won't even try it and makes herself some toast. The film, which is set in the 60s, is filled with foods I remember from my childhood even two decades on. I shared Nigel's loathing of the jelly that comes around the sides of tinned ham, and I remember school milk and many of the brands that you see on the shelves in Nigel's house. It really is a trip down memory lane. After Nigel's mum dies, he and his father live on cheese on toast for months; Mr. Slater then remarries, having first employed Helena Bonham Carter's character as a housekeeper. She wins his heart through cooking; there is a lovely montage where she puts dish after dish on the table and at the end of it Nigel has transformed from a child into a teenager. He rapidly enters a competitive relationship with Joan, as they each want the love and approval of Mr Slater senior. Nigel is the only boy to sign up for home economics at school, for which he is initially teased until his classmates realise his talents. The first time Nigel comes home from school with something he has made - scones - Joan is very put out, and from then on every Wednesday when Nigel has home economics and brings home a cottage pie or a dessert, Joan has really pushed the boat out and made something special which is already on the table. In some ways it's hard to dislike her - she comes across as a woman desperate to keep the affections of her husband, who is anxious and jealous of her step son, rather than intentionally malicious. Though she does have her moments! Nigel's father's favourite dessert is lemon meringue pie and Joan's is an impressive tower of meringue. She refuses to tell Nigel how to make it, so he spies on her, gradually picking up elements of the recipe, and experiments at every opportunity when she is out of the house. It becomes a real bone of contention between Nigel and Joan, and when he finally presents a perfect lemon meringue pie to his father, Joan - when they are alone - throws a slice onto the floor, hissing "I do the lemon meringues around here." Eventually she snaps, and feeling that her position is under threat, turns on Nigel and rants almost without pause for breath: "Do you think I'm stupid? Do you think I was born yesterday? I know what you're up to. Well two can play at that game sunshine. I'll cook boeuf bourgignon. Tomorrow we'll have duck a l'orange or should it be coq au vin? And then we'll have moules marinere. Oh yeah, I can do foreign muck as well, and that's just for starters. Quiches, tortes, omelettes, seafood soufflés, the bleeding lot. In fact, I think I'll just rustle up a tarte tatin, that's a caramelised apple pie in case you're wondering!". One of the things I love about this scene isn't just that every dessert mentioned is decidedly of its era (and wonderfully retro now) but that Joan misprounces everything! When Nigel's father dies - of a heart attack, possibly as a result of Joan's overzealous catering - Nigel rejects her efforts at reconciliation, says he never wants to see her again and runs away to London where he gets a junior job in the kitchens at the Savoy - and this is where the film ends, with the real Nigel Slater playing the employer and telling the young Nigel that "you'll be fine - you're really going to be fine." I loved this film - the era that it evoked, the storyline, the characters and the plot. When it came to entering Food 'n' Flix, there was only one thing I could really make - the lemon meringue pie that is the cause of such competition between Nigel and Joan. I couldn't seem to find a Nigel Slater recipe for lemon meringue pie on the internet, though I didn't spend all that long looking; I ended up using one from BBC Good Food and adapting it slightly. When I was a child and my great-aunt made lemon meringue pie, I didn't like it with "bits in", that is the lemon peel, so I left it out of this recipe. I also found that I didn't have any orange juice or oranges so I left that out and don't think it made any difference. I used a ready made pastry case as I had bought it for something else I didn't make and it was on the cusp of the use by date. I know Nigel Slater wouldn't approve, but needs must! Place the cornflour, sugar and lemon juice in a pan and heat until the sugar has melted. Then remove from the heat and stir in the butter until melted. Finally mix in the egg yolks and egg and return to a gentle heat until thickened. Pour into the pastry case - as I said I bought rather than made this. Whisk the egg whites for the meringue until stiff and gradually whisk in the sugar and cornflour. Heap onto the top of the pie - I wonder if it would have looked neater if I'd piped it but I was only making this pie for me and my boyfriend and didn't have the time or energy for anything more elaborate, having just returned from a university reunion weekend! Bake in a preheated oven at 160C for 30 minutes then turn off the heat and leave in the oven for another 15 mins. The meringue does break up when you cut a slice and it looks a bit messy when you serve it but it tasted amazing - the meringue was soft inside and slightly chewy on the outside and the lemon filling was delicious. Not quite up to Nigel Slater's standard, but I'm happy for a first attempt! I'm sending this to Food 'n' Flix, hosted this month by This Mama Cooks. Meringue is a tricky thing. I usually skip it and add whipped cream. Lemon meringue pie is one of my favorites, as well. My meringue never looks perfect, but it's the taste that counts! I could go for a big, fat slice of yours. So happy that somebody decided to make one ;). I love lemon meringue pie! This looks tasty!